Yes I know, another NARS product featuring here again. People are going to think I have a problem, aren't they? Seeing as I only got this into my base stash a few months ago, I figured I may as well review the product, especially considering that the warmer weather has decided to grace England with its presence! And I'm going to promise, this will be my last NARS post for a while! 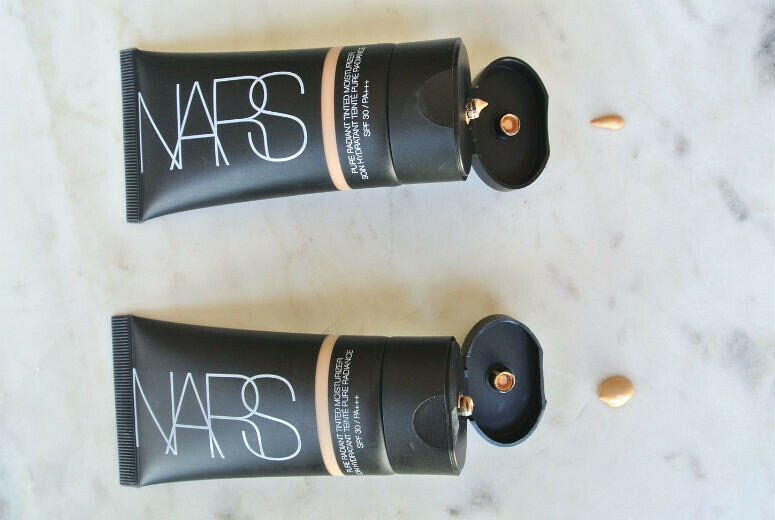 The NARS Tinted Moisturiser is a lightweight but buildable base that feels very comfortable on the skin, with fairly good lasting power. I would say that on an average UK day (ie one that is not especially hot) it stays pretty much in place for about 5 hours in my least oily parts, and then I will need to apply some powder. This doesn't mean it is greasy though, far from it. I would say it gives a rather healthy look to the skin. I made the mistake of being very quickly colour-matched and buying it on impulse, so I originally took home St Moritz which is far too orangey and dark for my normal skintone. This meant I went back and took Alaska, which is the colour I was originally expecting to match to, and is kind of close to the shade Deauville which I seem to take in all other NARS bases. I'm not too upset though, because I think with the onset of summer and a possible holiday coming up, I should go a bit darker, and will be able to use St Moritz then. I think that the packaging of a squeezy tube makes this a perfect base to take for travel. I normally go on holiday to Greece with my Greek partner, so I always prefer having a lightweight base for evenings out in the very hot weather. The fact that this tinted moisturiser comes in handy travel-friendly packaging, gives good coverage while not feeling heavy on the skin, makes it a perfect holiday companion. While I know that the Laura Mercier Oil Free Tinted Moisturiser is very popular, and was a something that I used a lot in previous summers, I think the NARS one may have edged over, mostly because the shade Alaska is a perfect match for me, while the Laura Mercier range tended to be either too pink or too orange for my skintone. I also prefer the fact it is a much lighter feeling base, which means if I use concealer, I don't feel like I have a full-on face. Though this is labelled a tinted moisturiser, I always do my usual skincare in the morning and finish with a moisturiser before putting this one on, because I treat it more as a makeup product than a skincare product. If a good coverage tinted moisturiser is on your shopping list for the warmer weather, then I think this one should be it!